SEVERAL sources have independently told us about EPO brain drain. People hand in their resignations in relatively high numbers. 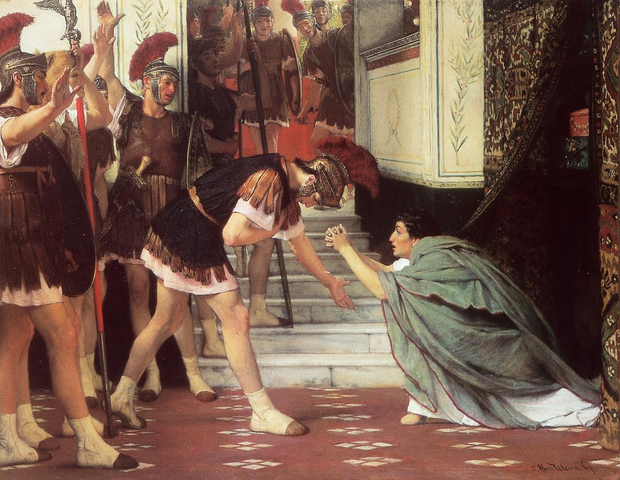 The President’s Praetorian Guard, nonetheless, isn’t being shrunk. 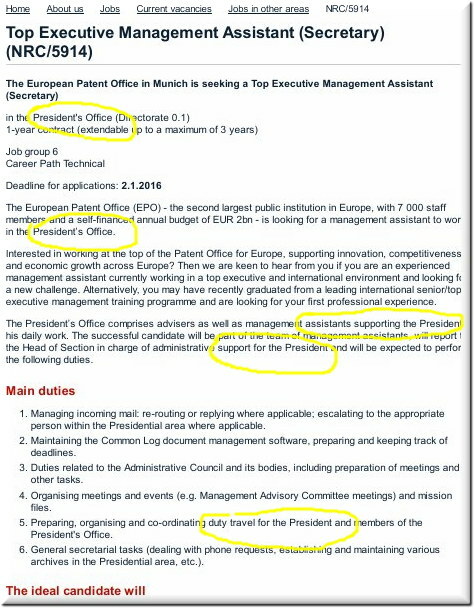 The EPO’s Napoleonic ‘president’ (fancy job title, more so than in the USPTO) already surrounds himself with bodyguards, some say he wants to have a limousine (we haven’t been able to verify this claim), and even if all talented examiners were to leave the EPO, lavish lifestyle and obscene expenditure for the almighty ‘president’ mustn’t and wouldn’t be compromised. The problem at the EPO is the general lack of respect for it employees contrary to the managments [sic] professions to the contrary. Furthemore [sic], the Head of the Investigation Unit, during a meeting where the workings of this Unit were introduced, was questioned. First of all he was asked whether it was true that an employee being investigated was not allowed legal council. He stated that this was correct. He was then asked if the information would be used in disciplinary proceedings. To this he stated that it was merely to see if a disciplinary proceedings should be conducted, suggesting that the information would not be used. It was then stated that if the information obtained during the investigation were to be used would this information not be illegally obtained evidence because of the lack of legal representation. To this he replied in an agressive [sic] manner that if the employees of the EPO didn´t like it the [sic] could leave, at which [point] a large group left the room. This felt a lot like intimidation. Where do you go to request an investigation of the head of the investigation unit for intimidation? So much for respect. To then expect EPO employees to treat the management [sic]with respect is maybe a little too much, although it would have maybe been better not to stoop down to come closer to the low level management exemplifies. 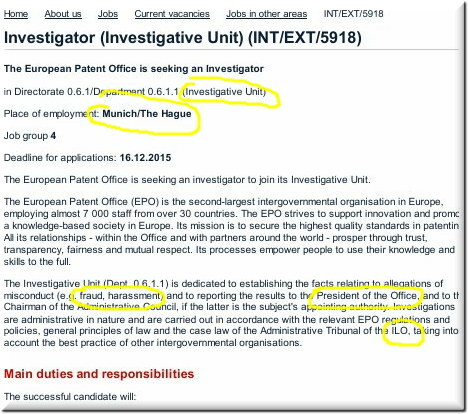 The EPO is now hiring even more people for its 'gestapo'. That is perhaps the EPO’s ‘growth area’ right now. More of the above. 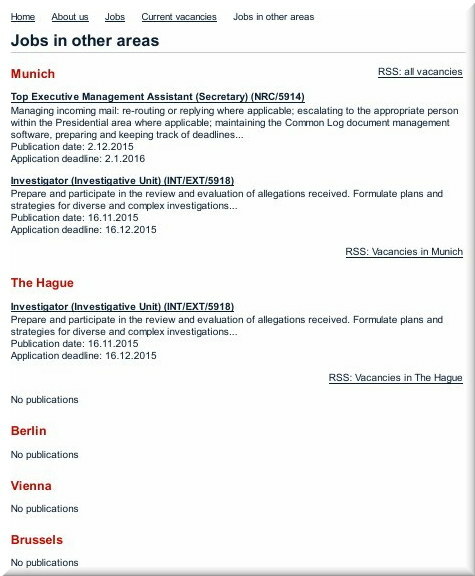 Someone has notified us of a curious new vacancy at the EPO — a vacancy which suggests that either Battistelli lost his assistant or is looking to recruit more. Here are the details from the EPO’s site (screenshots shown below to reduce the chances of tracking by the EPO’s ‘gestapo’).